Combat Wings Pacific Heroes Game Review - Download and Play Free Version! Excellent graphics as well as high quality sound. 20 various levels that let you fight both in the air and on the ground. Manning the gun of the B-17 bomber is a rush. 3 game modes including LAN or online play. Difficult to tell the water from the sky in a lot of missions. Enemies don't put up much of a fight. 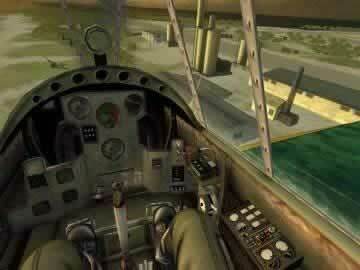 Combat Wings Pacific Heroes is a WWII aerial shooter game. 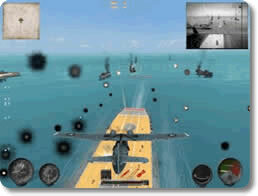 Choose your allied plane, take off, and fight Japanese planes and ships in various Pacific battles. Combat is easy. Use the arrow keys to thrust and the mouse to control the X and Y flight axis. Blast away with your main cannons or launch rockets to shred your enemies from the sky. Combat Wings: Pacific Heroes is a WWII based action/shooter that is set in the Pacific ocean, just off the coast of Hawaii. In this game which combines both air and ground fighting, your goal is to fight off the enemy Japanese and defend the U.S. soil. This game is an intense and graphically impressive game that makes keeping the skies clear of enemy attackers both fun and engaging. This game features three modes, which is great for any action/shooter game. In this you can take on your friend or others on a LAN connection or online play. You can also roam the skies alone in free play or complete missions in the 20 level single-player mode. The single-player mode makes this game special. In the 20 levels you will get to shoot down the enemy Japanese fighter jets trying to take you out, bomb enemy carriers, and storm Japanese occupied islands. As far as gameplay is concerned this game is smooth. The buttons are clearly labeled and the planes you fly are easy to manage and responsive, and figuring out the balance between the mouse and the arrow keys to navigate your plane takes little to no effort. Firing your weapons, especially your gunner, is also easy to do and figure out. You just need to line the cross hairs of your plane to the circled target that is your enemy. The only flaw with firing the weapon is with your secondary missiles. These missiles do not lock on, making it really difficult hit the opponent. If you do connect, it's a beautiful and explosive sight; however, nailing the planes down is a difficult thing to do. If there was a missile locking feature (though this would not be historically accurate) it would be much easier to fire and hit your targets with the explosives. Graphically, Combat Wings: Pacific Heroes is great. The planes are accurately portrayed and the details, even up to the bolts that hold the plane together, are visible and distinct. The audio effects are also fine tuned and accurate in this game. There is not too much outside noise. The game's sound is focused on the hum of the plane propellers and the sounds of the bullets leaving the gun. These effects are accurate and make the game more believable and enjoyable. Despite having great graphics, one issue does come up when analyzing the aesthetics of the game. It is difficult to tell between the water and the skies, especially on levels that are darker. This inability to distinguish the water from the rest of the map could cause you to fly too low and crash, or get totally confused because you can't tell up from down. Maybe when flying over the Pacific it is actually hard to determine the water from the sky, however, this game should break from being completely accurate and make a clearer distinction. Overall, Combat Wings: Pacific Heroes is a great flying simulation that will keep you interested for hours, especially if you are a WWII buff or plane enthusiast. The graphics and sound quality are great (minus the depiction of the sky in relation to the water), and the gameplay is smooth and easy to handle. The small level of violence and the tame language make this a game anyone can enjoy—young or old. Also, the 20 levels of single-player along with the online option make this a game that will last you a long time. Definitely worth the download, because the short trial might not be enough for you to experience everything this game has to offer. 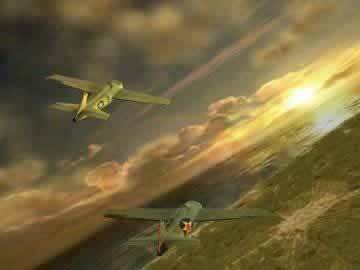 Player created video showing most of Combat Wings Pacific Heroes' first mission. Gameplay starts at about 16 seconds into the video.